Meng Ding Huang Ya Yellow Tea from Canton Tea Co.
Only the valuable, tender young leaf buds picked from high up on the cool misty peak of Mount Meng can be considered true Meng Ding Huang Ya. It is made in the original mountainous area where tea cultivation dates back more than 2,000 years and is a very famous tea. It was once made as an Imperial Tribute Tea during the Tang Dynasty (meaning it was only made for the Emperor and his Court) and is still hugely sought after. 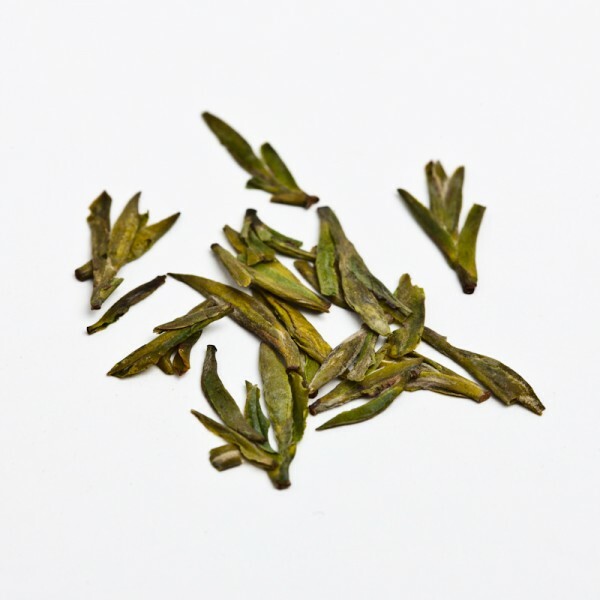 Meng Ding Huang Ya has yellowish green leaves with a fresh, raw nutty aroma. Because the leaves come from the cooler, higher level of the mountain, the buds have a less even, thinner appearance. Once they are infused, they become plump and soft and settle upright at the bottom of the vessel. Brew in a glass pot to appreciate this unusual quality. The liquor is bright yellow with a smooth, fresh taste that offers a sweet, nutty flavour with a hint of citrus. I love Yellow Tea. It is my favorite type of tea leaf. In fact, I love it so much that I bought a Yixing tea mug just for my yellow tea. At the time of this writing, I own three Yixing mugs: one for yellow tea, one for jasmine tea, and one for Ali Shan Oolong. But let’s get back to the tea that is in the mug that sits before me… this Meng Ding Huang Ya from Canton Tea is excellent. I steeped this tea in my gaiwan; I am sipping the combination of the first four infusions from my Yixing mug. A superior quality yellow tea such as this one submits to many infusions, I will get another full mug out of these leaves – a total of eight infusions. The flavor is so amazing. There is a sweet, nutty flavor. Not a toasty nut taste, but more of a creamy nut taste – like the flavor of blanched nuts. There are notes of flower that weave in and out of the sip, as well as a hint of sweet, tangy citrus that rests upon the palate in the finish. I also taste a note of melon that arrives at the start of the sip and melds nicely with the nutty note previously mentioned. There is a slight bitterness that hits the palate about mid-sip. This bitterness is a savory one. It is as if it is part of the nutty flavor which starts out sweet and ends with a hint of bitter. This note enhances the overall experience by cutting through some of the sweeter tones and adding dimension to the taste. A soft mouthfeel coats the palate – it’s almost cushion-y soft! The barely-there note of astringency cleans this softness away in the finish so that you want to take another sip just to experience the mouthfeel. It’s like the palate glides along the surface of a cloud – it’s that kind of heavenly experience. This yellow tea from Canton Tea Co. is a perfect example of why I love yellow teas so much. It’s absolutely exquisite … perfectly divine! This tea is rare as it can only be plucked at springtime. It comes from the mountain Meng, in Sichuan province, where tea growing started during Han dynasty, more than 2000 years ago. At that time, yellow tea was only served at the imperial court. The 5cm long leaves are green with a pale yellow hue. The interesting colour and flavour of that tea come from a very unique processing technique. The fresh leaves undergo a swift withering and are then rolled in small quantities in “Niu Pi Zhi”, a kind of old yellow paper, in which they are left to dry naturally. This tea shows a pale yellow cup with a mellow character with hints of walnut. This is much different from the yellow teas that I’m used to, but it is certainly just as enjoyable. Actually, when I first saw the leaf, I didn’t think it was a yellow tea, because the leaves are quite dark. 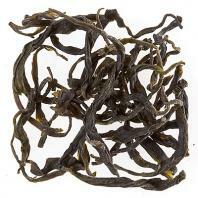 They have the appearance of a black tea, or possibly a well-oxidized Oolong. The flavor is also quite different from other yellow teas – this is stronger in flavor than most yellow teas which are usually a bit more delicate. This has a strong nutty quality and virtually no grassy or vegetative quality except at the finish, where there is an ever-so-subtle hint of a vegetal note. Not grassy, just a hint of vegetation. It is smooth and rich-tasting, with no bitterness, and very little astringency. It’s really quite sublime! It has a very pleasing buttery note that is sweet and creamy and complements the nutty note (which is likened to a walnut in the company description of this tea, provided above). It’s kind of roasty-toasty, but not too much, I think that even those that find they do not care for toasty tasting teas would find this quite enjoyable. This is truly a lovely tea to experience. I have said it before (numerous times, even! ): “I have found a new favorite from the brothers Dammann!” But… this time, I mean it! This is fantastic!